A Configuration is a group of general settings applicable per Client. The default Configuration applies to all new clients by default. You can edit a configuration by clicking on it’s name. How much credit does a client need to create new services (negative values are also allowed). Once a client has reached this limit, he will no longer be able to create or upgrade resources. When the client reaches this limit, notifications, suspension and terminations rules apply Notifications can also be sent prior to reaching the limit. See below. The From name for e-mails and notifications. Leaving this blank will use just the Notifications sender email. An e-mail address the notifications are sent from. When this is checked the billing cron job will generate invoices when services are due. When this is checked the billing cron will automatically settle client expenses by withdrawing funds from client credit. 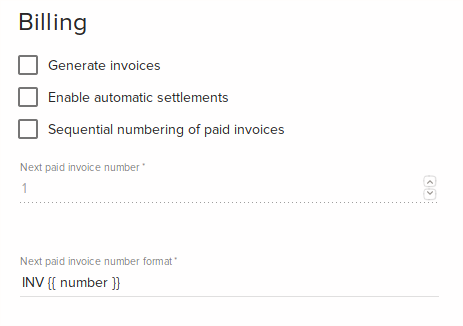 If Generate invoices is also checked then those invoice will be automatically paid from client credit. If client should be notified about their credit balance. For example, a client can be notifier with 72 hours before his credit balance will be empty. 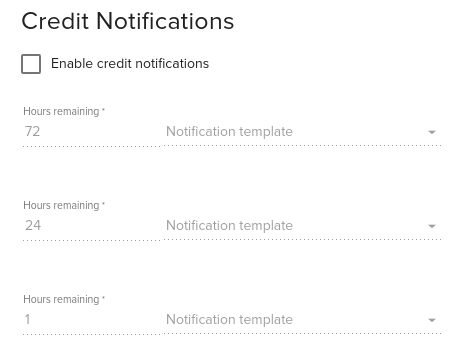 A total of three notifications can be created with variable hours until the credit reaches zero. Enable or disable automatic OpenStack project suspension and send a notification to the Client when this happens. 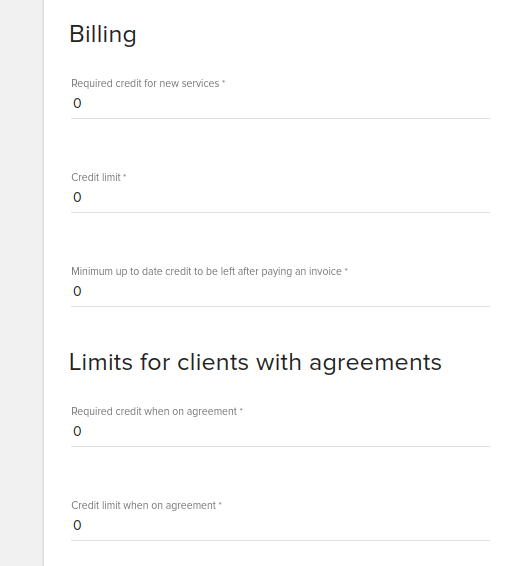 When suspension is enabled the client will be automatically suspended once up to date credit for the client is under the Credit limit specified at General section. Suspension can be delayed by checking Enable delay by hours or Enable delay until credit is used. If both of these are checked then client will be suspended when first delay is matched. 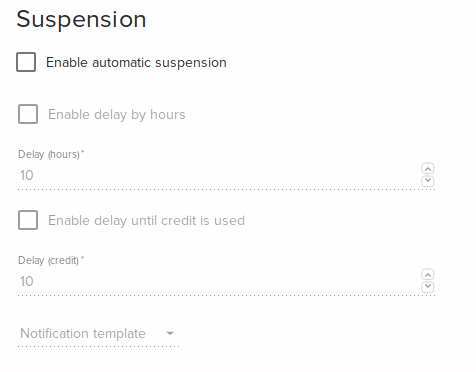 Suspension is processed by a cron job in fleio backend so there may be a delay until clients are suspended based on how often the job is configured to run. When checked clients will be automatically suspended when Credit limit is reached. When this is checked the client will not be suspended for the number of hours specified in Delay (hours} field even if the credit under Credit limit. When this is checked the client will not be suspended until credit is under Credit limit by the amount specified in Delay (credit) field. 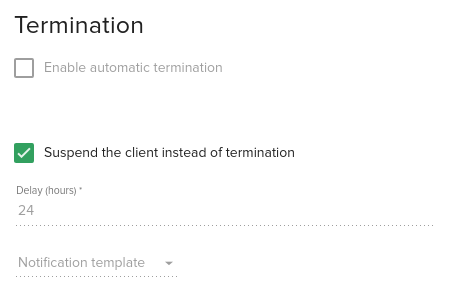 Here you can select the template used to send suspend notification to client. Automatic termination. Experimental, not yet enabled. Fleio allows having several configurations that you can assign per client. You may want to have some of the clients suspended automatically when they have depleted their pre-paid credit. Other customers do not have to pre-pay for services they use and are allowed to have a negative credit, but will not be allowed to create more resources once their credit reaches -5,000 EUR. You can also enable or disable notifications via email or end-user panel for each group of customers.